it's a new year, and i'm full of ideas for ways to organize, optimize, and minimize. on the organization front, one of my major peeves is a messy black hole of a bag where i can't find anything. to the rescue: zip pouches in a variety of colors and sizes to keep everything sorted. 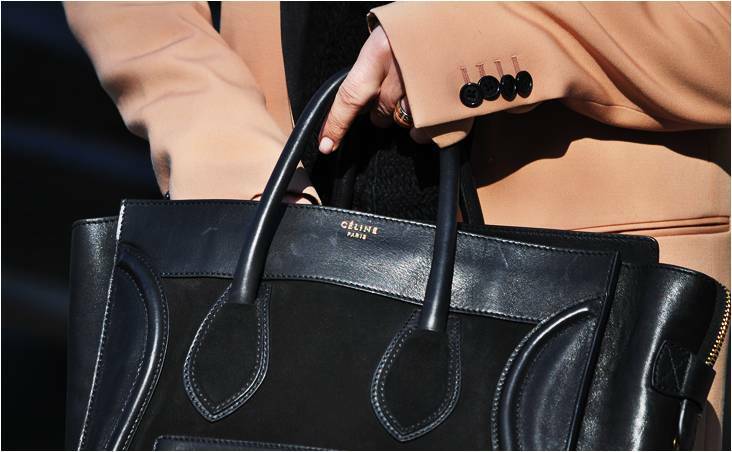 i also find that i'm more motivated to stay organized and take care of my things when there are little luxe details! my fave trusty key / zip pouch that holds my keys, ID, metrocard, and doubles as a mini wallet for nights out. a pickpocket stole mine earlier this year in Shanghai, but i got a new one as soon as i got back. the timeless large leather zip pouch by CdG – handy for just-in-case odds and ends, receipts, medications, or make-up. it doesn't hurt that it's gorgeous! i just bought one of these nifty and colorful Delfonics pencil pouches after my ratty old pencilcase finally gave out after 3+ years. essential for keeping pens/pencils all in one place and not marking up (or exploding) inside your bag. 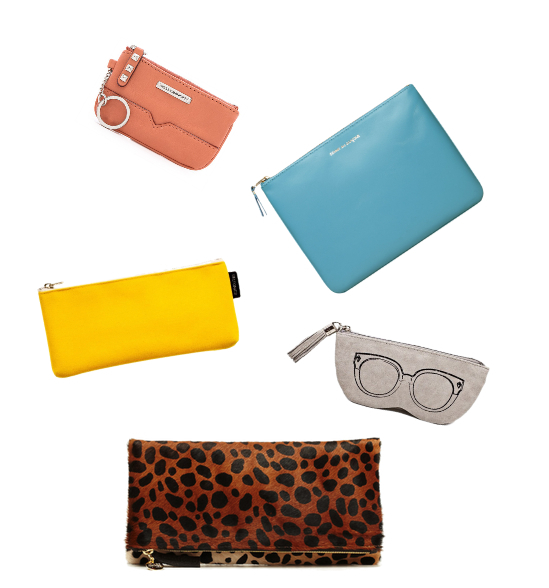 also just found this adorable sunnies pouch on sale (more colors) exactly what i need! my sunglasses are currently sloshing around my bags because the hard case it came in is massive and too heavy. and finally, a foldover zip pouch (also on sale) that doubles as a quick-go clutch for lunch breaks or after-work drinks that holds everything important: phone, wallet, lipstick, keys. p.s. : i also always stash a colorful Baggu tote in whatever bag i'm carrying - they fold up into a neat little square and are super handy (and eco-friendly!) for errands, groceries, or gym extras. what about you? how organized is your bag? Great topic - I dislike having a messy bag as well! Firstly, I've been looking for key wallet for the longest time and must buy one soon. Because I rotate my bags frequently the things I carry are pretty much down to essentials for ease of transition. My sunglasses are Raybans that has its own light case, small make up bag, wallet, mobile, mini pack of tissues. Sometimes I need to add a small notebook and pen but since my tiny mobile has a note writing function with its own stick pen, I avoid the need for a real pen most of the time. I rely on the pockets and sections in my bags and the interior of my Kellys is the best! Since I've stopped using my big totes and moved over to medium and small sized bags, I've been able to keep things a lot tidier! compared to a few years ago, i don't use massive bags anymore, but i still need a large-ish bag for travel and work/weekend. yay! please update on this new frontier :) i think it's fun to work out a colorful and hopefully stylish organizational system for everyday. I've grown to like those little pouches, esp. since I'm changing out my bags constantly sometimes 2x a day, and I just move the pouches from purse to purse. I don't believe in spending a lot of money on them, some came with the bag, others wear bought eons ago, or cheapie gifts from visiting relatives. hear hear! i also like baggu nylon bags and pouches :) they're lightweight and inexpensive but still colorful and come in fun prints. Messy bags seemm to be a universal problem to all women.great post title and of course you own a great bag. My bag is pretty organized, actually - no mess, lint or crumpled paper. I guess I'm somewhat of a bag neat freak :) I carry a smaller leather makeup bag, my planner, my phone, a nutrition bar or two, my reading glasses, my ear buds have a pouch of their own, and then there's my card holder and my key card for work. My only problem is that both my bag and every single item in it is black! I adore pouches too - I use a Muji one for my vitamins and makeup, a freebie canvas pouch I got at a UN event for my credit cards, visiting cards and mints, and assorted nylon pouches for anything extra. All my handbags include an inside zipped pouch so I tend to use that for keys, a pocket mirror and any odds and ends. Just recently discovered the usefulness of having a few pouches full of things in my bags....initially I thought the idea fussy, but quickly realized how awesome it was to be organized so well! I have always prided myself on being organized but with my purses, I can't seem to hold on. I too carry little pouches for light make-up, random business cards, and etc., but at the end of the night everything is loose at the bottom of my purse and my wallet is busting out! mine has held up remarkably well, leather and keyring and all. and i throw it around all the time too. :) it's definitely one of my essentials - this way i never lose my keys or my metrocard! I agree! Good strategy. More fiddling before going out, but much less fiddling in action:). I love pouches also. I have to have an organized bag! I adore Baggu's little pouches for my various chargers, personal items for the gym and for travel. I carry a key pouch for my keys, work IDs, and metrocard. I also carry a small makeup case for touch ups and a card case for my business cards.